The Basics of Organizing Course is a Free Online Course you can begin right away. It is our service to you, free of charge. Any organization requires an executive structure that provides supervision and coordination of the divisions’ activities. 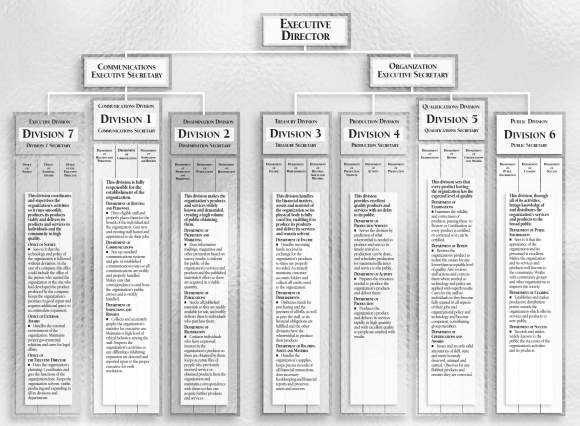 On this seven division organizing board, each division is headed by a secretary. To provide optimum guidance to the divisions, there are two Executive Secretaries. One supplies direction to three divisions; the other, four divisions. The entire organization is headed by an Executive Director. He works with and through the Executive Secretaries to see to the production and expansion of his organization.